We admit that our weekly review of market breadth, in which we observe the continuing deterioration in all types of indicators that monitor the internal behavior of the world stock market, is becoming a bit repetitive. But as stock indices this week make new all-time highs we couldn’t help but show, again, a cross section of charts indicating weakening internal dynamics of the stock market. 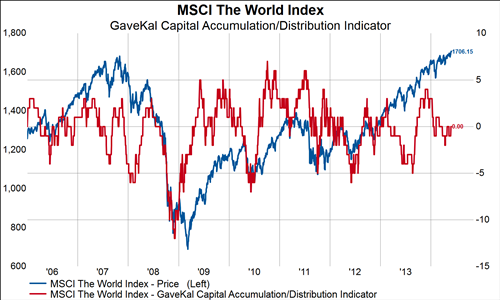 As usual, our analysis covers the MSCI World Index, which represents 90% of the global investible market cap. 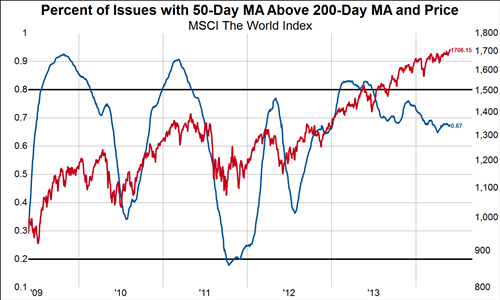 We’ll start with the familiar chart showing the percent of stocks making new 200-day highs. 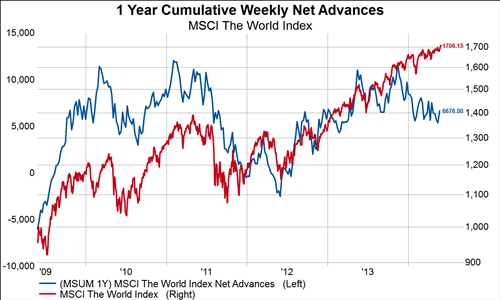 Nearly every time the World Index has made a new cycle high since late 2013, fewer and fewer individual stocks have made a new 200-day high, with the current breakout being no exception. 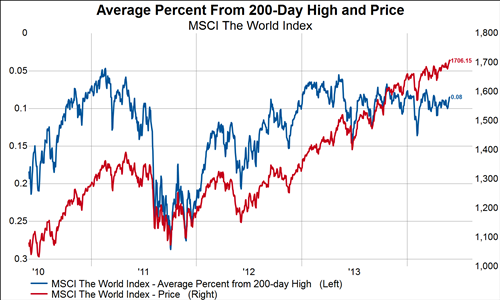 Even though the World Index is sitting at an all-time high, the average stock is 8% away from it’s 200-day high. 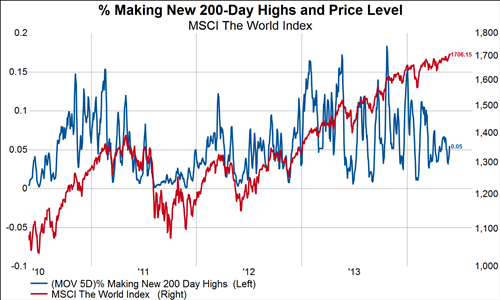 Since the middle of 2013, each new high in the World Index has been met with the average stock trading further away from its 200-day high. Our accumulation/distribution indicator has diverged from stocks since the end of last year. A one year cumulative total of weekly advancing stocks minus weekly declining stocks has diverged from stocks since the end of last year. 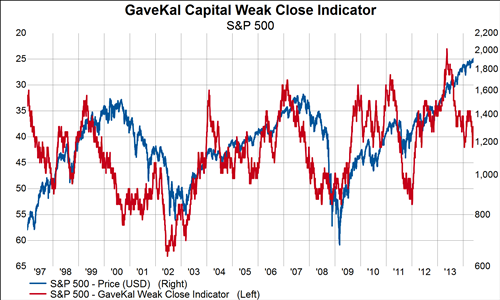 Even though we are at new highs, our brute indicator that measures the percent of stocks with positive price momentum keeps heading lower. 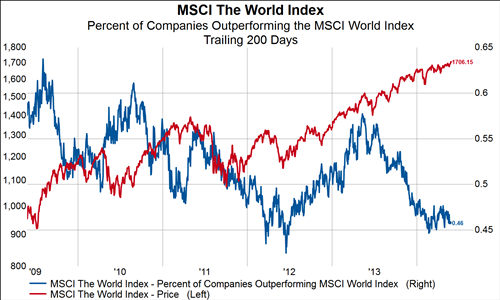 The percent of companies that have outperformed the MSCI World Index over the last 200-days is still near a two year low. 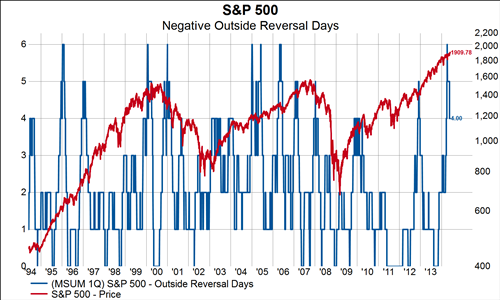 The total number of negative outside reversal days over the last quarter (days in which both the intraday high is higher than the previous day’s intraday high and the close is lower than the previous day’s intraday low) is still elevated. The number of weak market closes is on the rise and continues to diverge from stocks.